Google Calendar is an amazing free online calendar that got our backs since 2006. Whether you are a businessman or an individual, Google Calendar keeps everyone’s life in order with peace of mind. This free service of Google Calendar not only helps you keep track of your events and reminders but also lets you rely on it to invite other users to the events. However, no matter how much does you know about Google Calendar, there is always a room to learn more about new things and avail all the advantages. 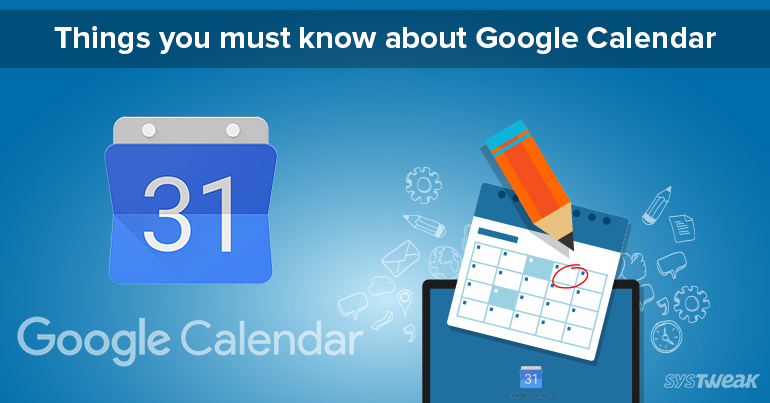 So, here we are going to discuss the things that you must know about Google Calendar. Days are gone when mouse was used to work on your computers. Using a Keyboard shortcuts is the easiest and quickest way to boost up your productivity. Press K or p, to scroll to the previous date range. Press J or n, to scroll to next date range. Press T, to view today. Press 1 or D, to view day. Press 2 or W, to view week. Press 3 or M, to view month. Press 4 or X, to Custom view (default 4 weeks). Press 5 or A, to view agenda. Press C, to create a new event. Press CTRL + Z, to undo your last action. Press backspace or delete, to delete the event. When you add the locations to the events, it reduces the pain or providing directions and turn-to-turn navigations to your friends and colleagues. People can easily view the location on Google maps and everyone will be at time. Adding a location hardly takes a minute of yours but it saves a lot time for others. In order to add the location, all you need to do is just type in the address of the location within the ‘Where’ field while creating a new event. Sometimes due to technical glitch and poor network, you’re not able to use internet and affect productivity; but not anymore. Fortunately, with Google calendar, you get the facility of enabling offline syncing as long as it’s required. In case, you are using Google Chrome, select the Settings cog, (available at the top right-hand side corner of your screen,) and choose Offline. Note: Please keep in mind that it only syncs your default calendar, which means you don’t get a rich, layered view of your typical online calendar. Keeping a track of work events, home chores and as well as side project make things cumbersome and confusing. Sometimes, you might wonder how other people deal so normally and never forget any event. Well, the answer is, they sort and organized their calendar with different color codes to avoid unnecessary confusion and troubles. Moreover, making a separate calendar for each area of life not only gives you well organized calendar but also helps you to figure out the time limit spend on each category. There are times, when you miss out on something important while working on other projects. It happens due to the recklessness and cluttered calendar that you may be using. So, switching to an agenda mode can help you stay focused when you have tons of workload from your boss. Sometimes, you end up creating too many calendars according to our preferences. However, each and every folder is important, but not all the time, as you don’t need to access them every day. However, with Google Calendar, you can hide the folders of calendar you are not using right now. So, these are some of the vital tips and tricks that you must know about Google Calendar. Use them and let us know what do you think about them in the comments.